With a few notable exceptions who went looong, you’ve been hitting the hills this week. Welsh hills, Lakeland hills and our very own local hills. Those gruesome hill rep sessions seem to have been paying off as there have been outstanding individual performances, some great team camaraderie and a lot of miles covered by you all. Belt up for a roller coaster ride this week! Jane Hylands FV45 was Clayton’s sole representative in this midweek 5k won by M. O’Malley in 16:20. Jane came in 38th in 25:46. 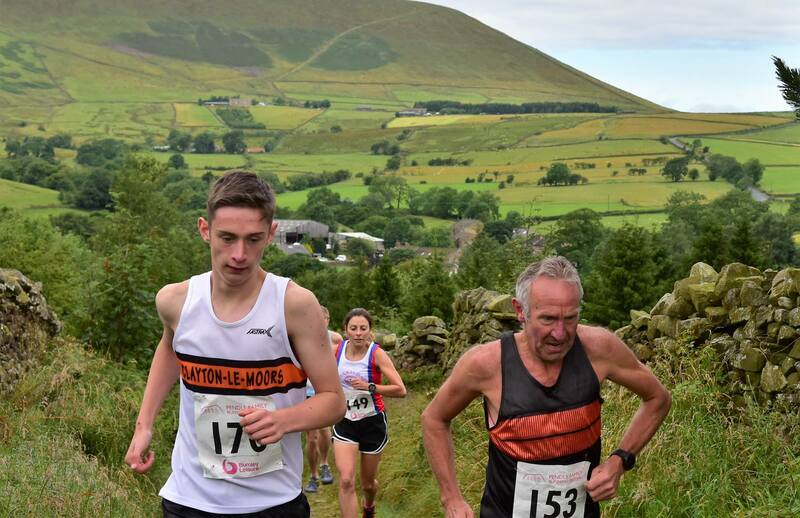 “Always keen to try a race I’ve not previously done I headed up the M6 for the Friday evening event held just outside Sedbergh, in a field next to Buckbank Lane, just off the A683. 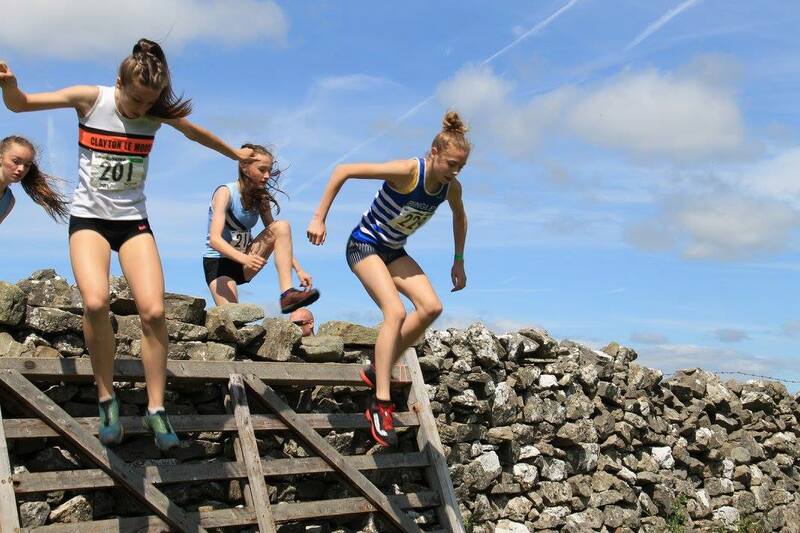 Sedbergh Sports is a typical Cumbrian local show with plenty of novelty events for children and adults, comprising of 3 legged, sack, potato, tyre rolling, sprint, ½ mile handicap, 1 mile handicap races, plus the fell races for U7s upwards. The senior route took us out, after a lap of the show field, along Buckbank Lane before the steep ascent of Knott. On the initial part of the climb I managed to eventually pass Wendy Dodds and was amazed to look up and see the eventual race winner, Josh Boyle, actually running the climb. Wendy and I were in walking mode at this point and it wasn’t long before she came past me again and it stayed that way for the remainder of the race. Once Knott was conquered the ascent up onto Sickers Fell ensued, followed by a fast, exhilarating, descent into the show field. Despite having what I thought was a decent run, I only finished 36 out of 38 runners. 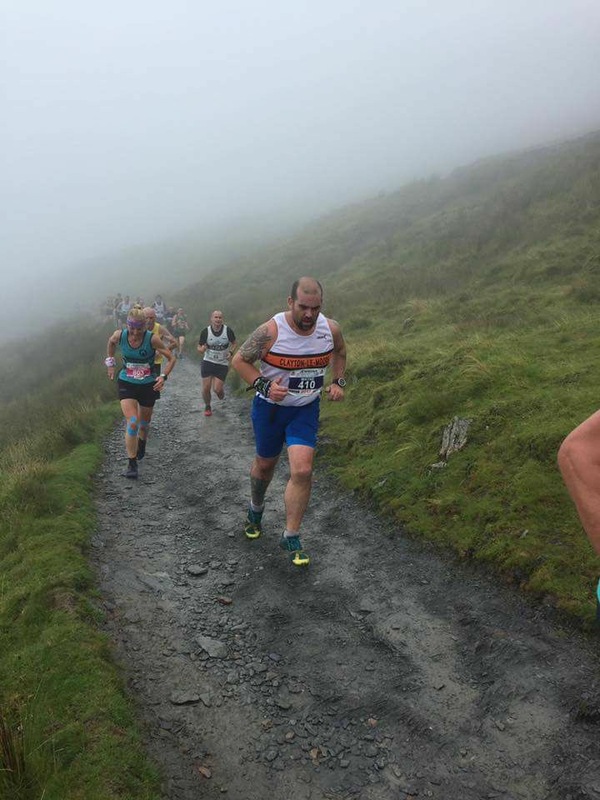 The big fixture of the weekend was the Snowdon Race. Held since 1976, its 10 miles up and down format on Wales’ highest mountain has led to its classic status on the mountain running calendar. Incidentally the male record for this race has stood since 1985, being one of Kenny Stuart’s enduring times from that golden era of fell/mountain running – an amazing 1:02:29. A large contingent of Clayton runners made their way to the top bit of Snowdonia for the start in Llanberis. 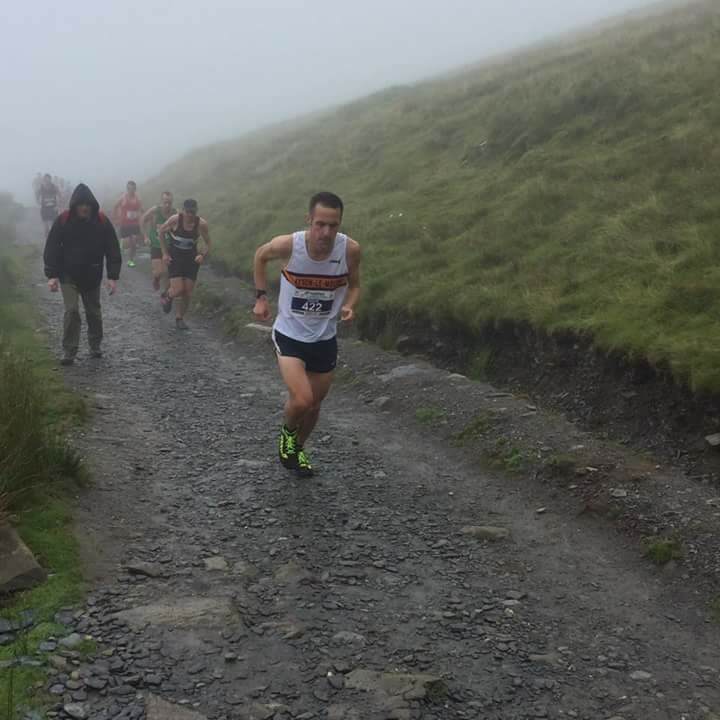 Quickest up and down in somewhat claggy conditions, and with the added cachet of wearing an England vest for the second time was Chris Holdsworth. He came a stunning 4th place in 1:09:17, 1 second off 3rd place and 3rd English counter behind the Italian winner Magnini in 1:06:42. 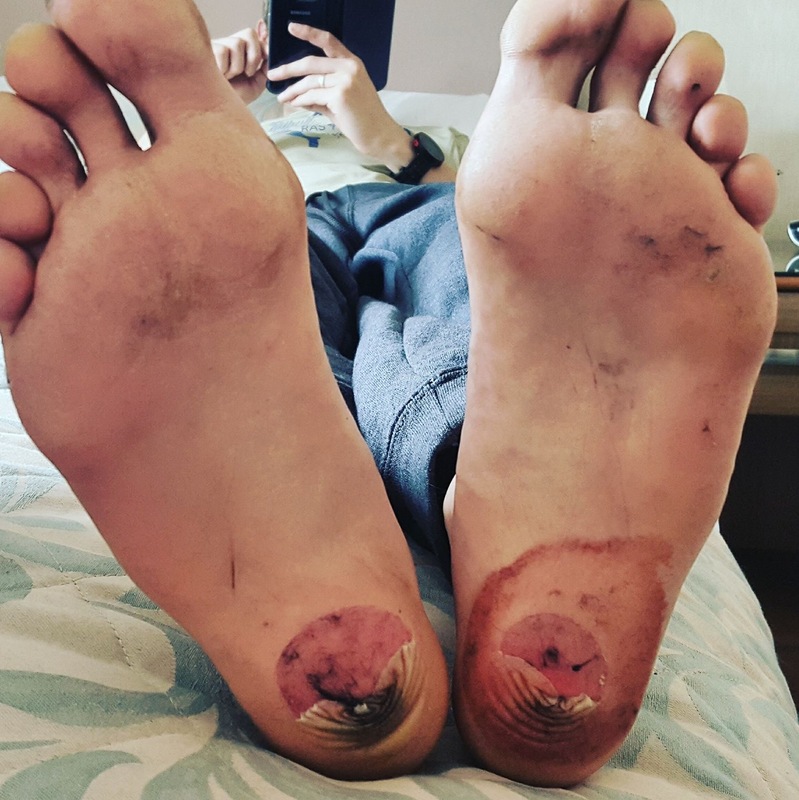 Behind a cast of, well maybe not thousands but 10s of Clayton vests supported him with special mention going to Richard Stevenson who managed to rip the skin off not one but both heels during the descent. Ouch. Dave Motley working on his way up the claggy climb. Full results to follow when available. A few hardy (foolhardy?) 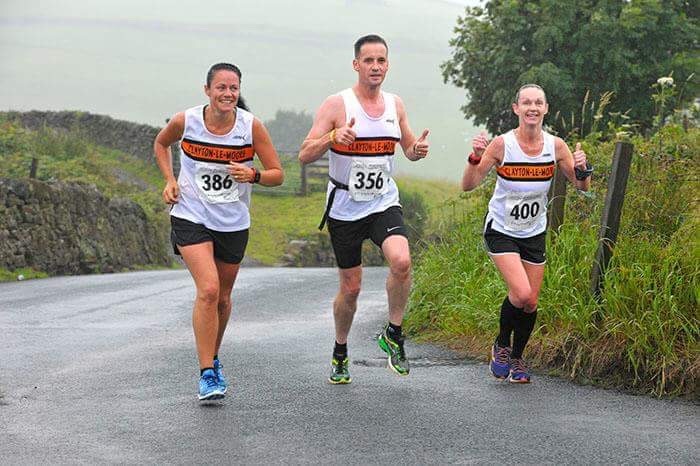 souls decided they hadn’t had enough of hilly half marathons the week after Hendon Brook and so opted to run the half distance at the Pendle Running Festival, an event growing in popularity owing to its relaxed atmosphere, additional family activities and scenic location in Barley. 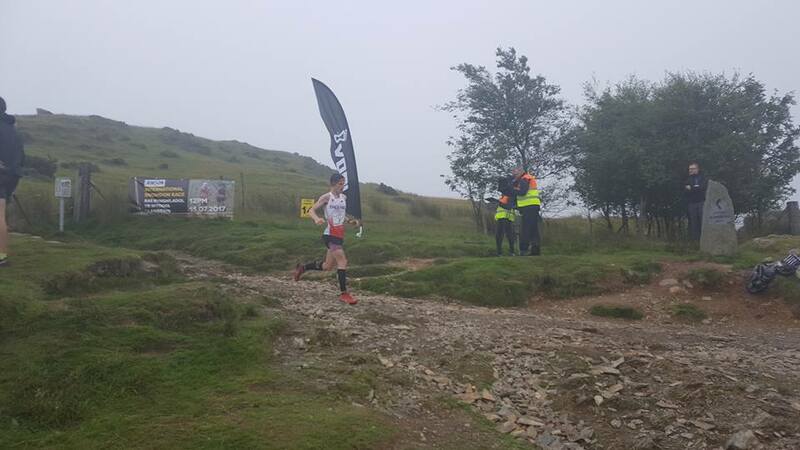 With over 2000ft of climb in the half, and over 800ft in the 10k the routes were accurately described as challenging.Tom Brewster SEN was first Clayton runner home in the 10k in 3rd place and 40:05 whilst James Boult MU23 led the way in the Half in 1:39:18. A trio of Clayton runners still nursing Hendon Brook legs formed a pact before the half marathon to sing, cajole and support each other round the hilly course. The Ridgeway is old. Really old, and steeped in Iron Age features and subsequent history along its 100 mile-odd route through the Chilterns to the North Wessex Downs. 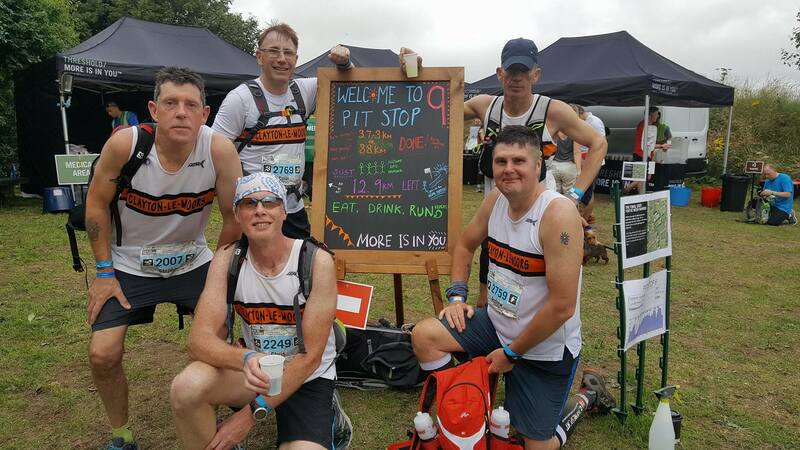 It makes for great open trail running too as the Clayton team of Chris Funnell, Stephen Ainsworth, Rob Morrison, Andy Webster, and Colin White found out when they entered the 100km Race to the Stones, the stones in question being the iconic stone circle at Avebury. Back in late 2016 during one of our Sunday morning long run and natters we decided to try something different and Stephen suggested we gave Race to the Stones a go in 2017. The appeal was that this would be a good challenging distance (100K ultra over 2 days) and was the equivalent of trail running glamping as everything was included. The run itself is along The Ridgeway which is an ancient 5000 year old trail from the Chilterns to the North Wessex Downs. This is trail running at its most scenic with miles of rolling hills and spectacular views. The forecast for the first day was cloudy but dry with temperatures around 22 degrees. The reality was cool with regular showers which kept the running to a comfortable temperature. There were refuelling stations every 10-12K with every type of sports nutrition you’ve heard of and quite a few I’d never come across. We quickly realised that our loaded backpacks which carried enough provisions for a weeks wild camping were totally superfluous as we took refuelling to a whole new level and Andy commented that he’d eaten less on all inclusive holidays. Our plan was to run the route together as Team Clayton and soak up the whole experience. The end time wasn’t important. We all expected to comfortably complete the first 50K but the big question mark was how we were going to feel trying to get going again the next morning. We arrived mid afternoon at the half way camp where virtually every whim was catered for including unlimited hot food, bar, hot showers, massage, medic tents, pamper tent, sports nutrition, yoga class, live music, stretch out area and rollers and chill out zone complete with bean bags. In true Northern style we made full use of all the facilities. The overnight stay was in one man tents and runners and walkers arrivals continued to be announced over the speakers late into the evening. Between the wind rattling the tents and Rob shouting in his sleep we didn’t get much shut eye (apart from Rob) and at 0500am we all popped out of the tents bleary eyed and wondering how the legs were going to hold up. A hot shower, porridge and full English later we all felt refreshed and good to go again and we set off just after 0600am although this was considered a late start and a big contingent had already left earlier.With the second day promising to be a bit warmer we all donned our Clayton vests. The scenery the second day was even more spectacular than the first and the early morning was calm and cool and it felt great to get the legs moving again. The route contained roughly 6000 feet of climbing and we were getting lots of shouts of “good effort” as we overtook lines of people without breaking pace as although the climbs were long and these weren’t hills by Northern standards. At the refuelling points everyone remarked on how we had stuck together and ran the challenge as a team. Mostly it was just pairs or individuals. Although most didn’t know where Clayton le Moors was many made comments about its infamous running history including Ron Hill and other Clayton le Moors legends. After we had been running for a couple of hours Colin started grimacing as an old hip injury resurfaced and the next 20K proved to be the biggest test for Team Clayton as we battled through each 1K using a combination of encouragement, painkillers and shear determination. Andy’s stock phrase of “it’s just around the next bend” was no longer having effect and we were trying to decide if we had enough provisions in our backpacks to knock up a quick field stretcher. After force feeding Colin a handful of Randoms and lying that it was only 5K ( or one Parkrun) to go we dug deep for the final push and the glory that awaited at the finish which was at the Bronze Age stone henge at Avebury. At the finish line we had mixed feelings of pride of starting and completing as a team but sorry that it had come to an end. Although it was never about a fast time ( as we stayed much longer than most at the refuelling stops), Steve came away with the Vet 60 1st place which was the icing on the cake. Over a few beers we celebrated and relived our whole experience and talk was already about ideas for the next trip. Four Clayton Juniors (Briony Holt, Ella Dorrington, Jenson Bentham and Christopher Brown) attended the Junior FRA ‘do’ at Marl Pits Rossendale. Part social, part prizegiving, the event was hosted as in previous years by Rossendale Harriers and combined running and coaching sessions, planning for the future and a talk from fell legend Steve Birkinshaw. 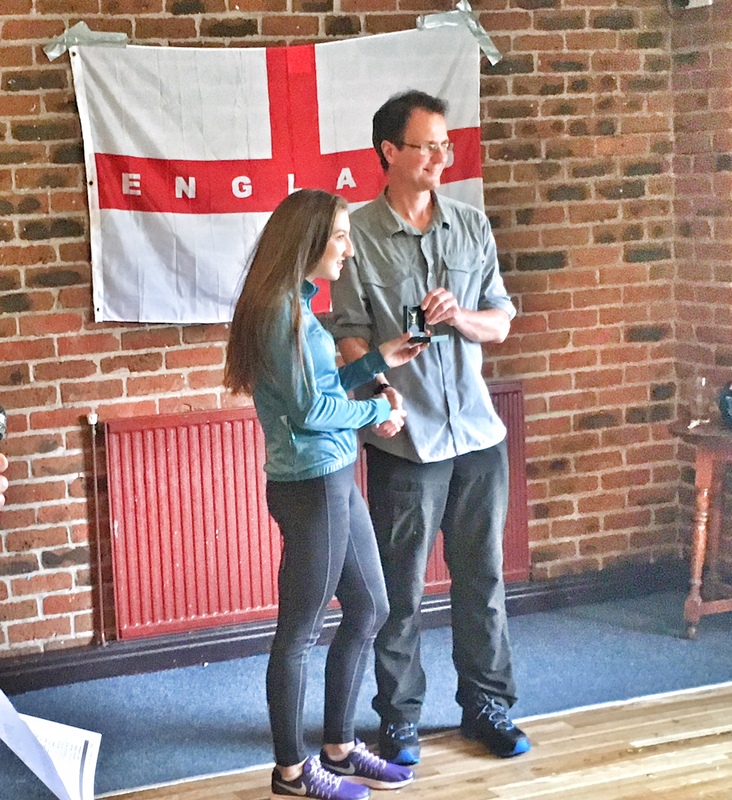 Briony was there to pick up her 3rd place award, presented by Steve Birkinshaw, for the season long English Championships U17G competition, a fantastic achievement in only her first year in that age group. This edition was won by Joshua Jardine MU23 in 1:32:55. Andy Armstrong MV40 was first Clayton finisher in 100th in 2:04:24, Jack Holt MV60 105th in 2:04:56, Alan Dorrington MV40 214th in 2:23:53 and Wendy Dodds FV60 241st in 2:30:48. 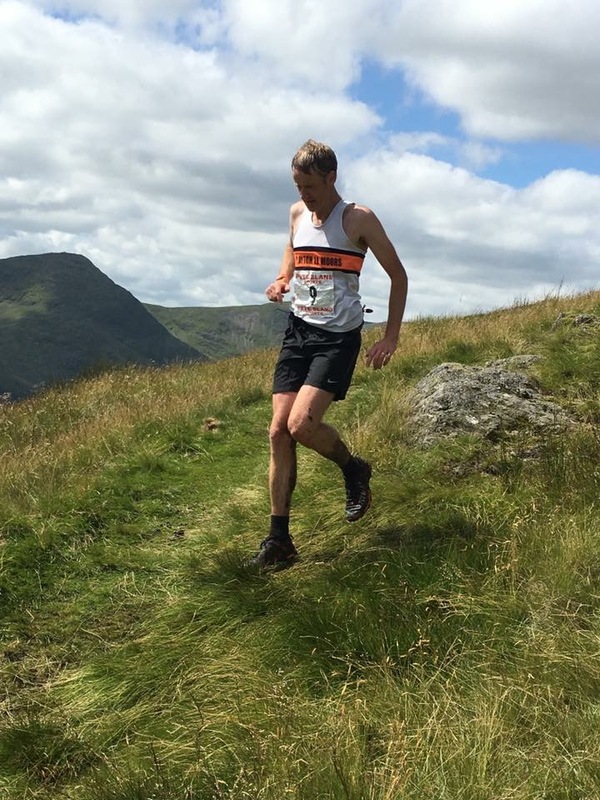 “The Kentmere Horeshoe is a 12 mile/3000ft fell race in the old school tradition. It starts on a narrow country lane (ensuring a mad scramble for positions as the race heads up out of the village) and it finishes in a farmer’s field where water is available out of the back of a car. The presence of Pete Bland’s iconic red van, coupled with tea and sandwiches in the village hall afterwards complete the picture. No medals, no Tshirt, no Tannoy! 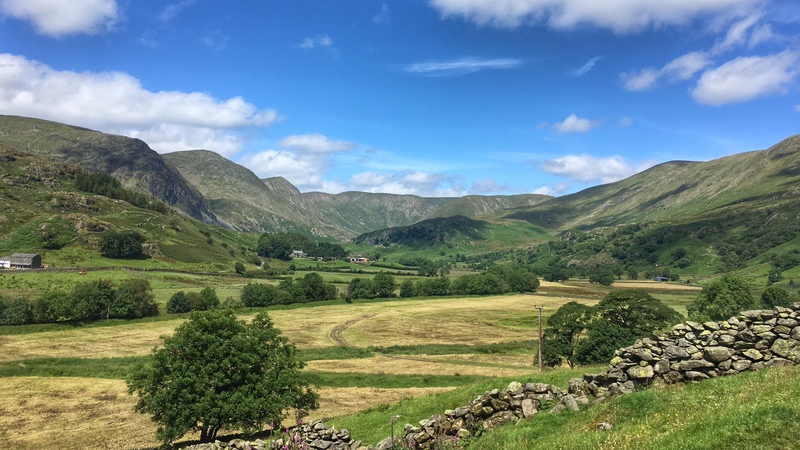 Between the start and finish is one of the prettiest horseshoe courses in the lakes with views beyond Windermere to the west and Haweswater to the east. A dry sunny day guaranteed fast times and comedy vest tans all round. 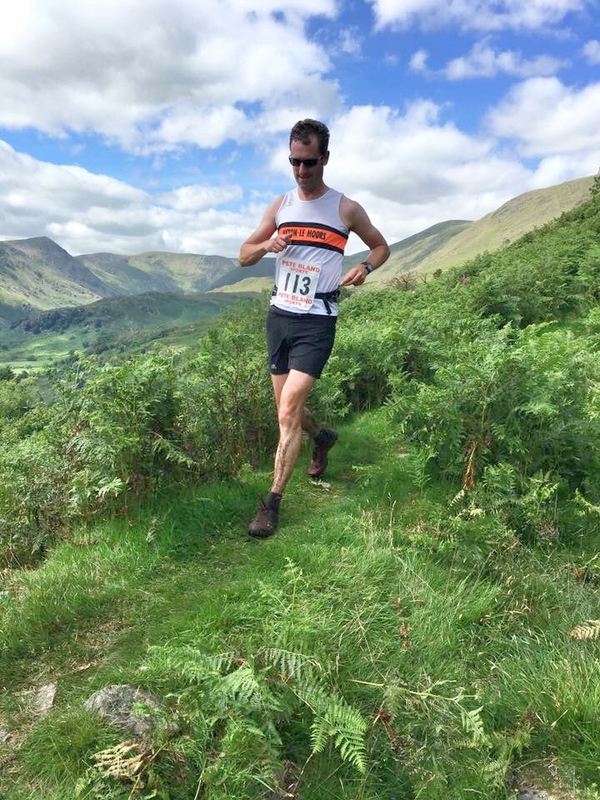 Four Clayton members made the trip to Kentmere; first home was Andy Armstrong in 100th place chased all the way off the fell gate by Jack Holt in 105th (3rd MV60). Alan Dorrington was next in at 214th then Wendy Dodds some time later in 241st position (1st FV60). The race is not without its dark side – Judith Taylor of Clayton lost her life on this course in 1994, during what were described as truly horrendous blizzard conditions. However on a clear day this would make a great introduction to anyone seeking to do longer fell races in the Lake District. Briony Holt continued her super run of form with a solid 2nd place and 9th overall in the U17 race held on a fast and for BOFRA, relatively tame grassy course. Day two of the Festival saw the Trail race with a game amount of climb around Barley, Newchurch and Whitehough. 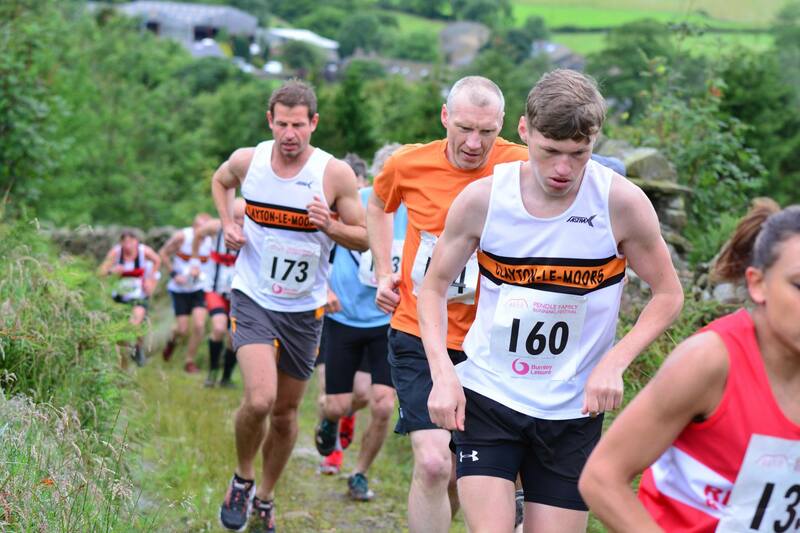 The race was won by Burnley and Pendle regular Nick Gaskell in 31:40 and first Clayton runner home with a fantastic performance was 15 yr old Junior Nick Henessey in 6th place and 37:32. Last but certainly not least given his efforts, Jon Cleaver has been quietly doing the lengths, kms and miles in preparing for the classic Ironman UK grueller, and joined fellow multiple kit option devotees at the start line in Pennington Flash on Sunday. Here’s how he got on – wonder if he’s going to get the tattoo now? Burnley Junior Parkrun – a total of 77 runners took part. 2 Robbie SMEDLEY 07:21 JM11-14 New PB! 14 Jake ANFORTH 09:10 JM11-14 First Timer! 27 Fraser ANFORTH 10:19 JM10 New PB! 30 Ellisia SMEDLEY 10:41 JW10 New PB! Burnley parkrun – a total of 368 runners took part. 47 Charlie BARNES 22:14 JM10 New PB! 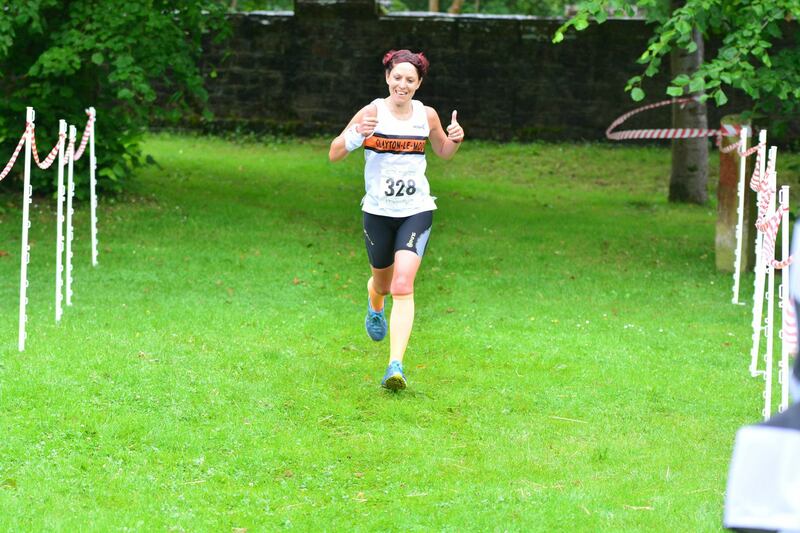 Pendle parkrun – a total of 76 runners took part. Witton parkrun – a total of 94 runners took part. 57 Christine Jennifer EGERTON 33:26:00 VW65-69 First Timer! Eglinton parkrun – a total of 104 runners took part. Ayr parkrun – a total of 47 runners took part. Dewsbury parkrun – a total of 113 runners took part. Bramhall parkrun – a total of 387 runners took part. This entry was posted in Juniors, Other News, Roundup, Seniors, Seniors Fell, Seniors Road, Seniors Trail by Alan Dorrington. Bookmark the permalink.